You can use voice recognition software on your Pocket PC. 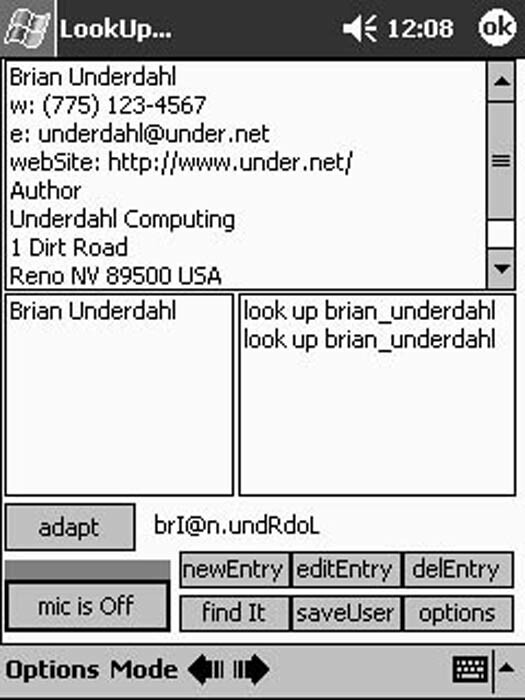 A popular software package that’s available is Voice LookUp from HandHeld Speech (Handheldspeech.com). This amazing application enables your Pocket PC to recognize your voice so that you can look up contact records simply by speaking the name you want into the microphone. When you have someone’s record on-screen, placing a call to him or sending an email message is just another simple voice command away. You can even use voice commands to switch to different applications on your Pocket PC. You can download a trial copy of the program from the HandHeld Speech Web site, and register it after you see how well it works. Voice LookUp is a very easy program to use. After you have downloaded and installed it, you should set up your Pocket PC so that pressing the Record button on the side of the unit starts the program (the readme file that accompanies Voice LookUp tells you exactly how to do this). This makes it even easier for you to use Voice LookUp because you can do so just by pressing that Record button. Before you can use Voice LookUp for the first time, you need to spend a few minutes training it to recognize your voice. To do so, tap the Enroll icon in the Programs folder and then spend about five minutes reading some text. At the end of the enrollment, you can begin using the program (although you should continue training it as you use the program to improve the accuracy — see the user documentation included with the program for more details). After the enrollment is completed and you start the program, you see the LookUp screen. This is your starting point for using Voice LookUp. When the LookUp screen is displayed, you see a message in the lower-left corner of the screen telling you that the microphone is off. Now it’s time to have some fun. Press the Record button so that the microphone turns on, hold the microphone on your Pocket PC close to your mouth, and say “look up” and the name of someone in your Contact list. Figure 1 shows the result. Figure 1: Voice LookUp finds and displays your contacts by listening to your voice. After a contact record is displayed, you can easily send an email or place a phone call to that person. For example, you can press the Record button and say “call work” to tell Voice LookUp to dial your office number. When you enter your command, a countdown timer appears on the screen, and at the end of the countdown, Voice LookUp plays the proper touch-tone dialing notes from the Pocket PC’s speaker. By holding the Pocket PC’s speaker next to the telephone receiver, the call is automatically dialed. If you find that the program has displayed the wrong record, choose the correct record from the list above the Adapt button and then tap the Adapt button. As you continue to do this, you will find that Voice LookUp finds the correct record far more often. You should do a bit of training before you start bragging to other people about how smart your Pocket PC is, but you’ll find that it is time well spent — especially after you see the reactions on people’s faces when they see your Pocket PC respond to voice commands!